Stria holds 100 per cent ownership of the Pontax-Lithium property located in the west-central James Bay territory in northern Quebec. The property, which Stria acquired from Khalkos Exploration Inc. in 2013, is host to a recently discovered swarm of a dozen spodumene-bearing (a lithium mineral) pegmatite dikes, each one metre to 10 metres in thickness, plus a series of small centimetre-thick dikelets. The lithium-bearing dikes outcrop over an area of 450 metres by 100 metres (for more information, click here to view the NI-43-101 Technical Report (Girard,2013) on the Pontax-Lithium Property). Situated north of Rupert River and south of Eastmain River and Opinaca Reservoir, the property consists of 70 contiguous map-designated cells for a total surface area of 3,718.84 hectares. The James Bay Road (Route 109), a paved highway linking the mining town of Matagami in the south to the village of Radisson 620 kilometres to the north, is located 22 km to the west of the property. Chambois Lake, suitable for seaplane landing, is conveniently located 5 km to the east. A 735 KV power line, with a maintenance trail under it, is adjacent to the property. The Pontax-Lithium property is a part of the former joint Sirios Resources Inc./Dios Exploration Inc. exploration project where a lithium-bearing pegmatite dike was discovered in 2007 during the course of regional geological reconnaissance work. 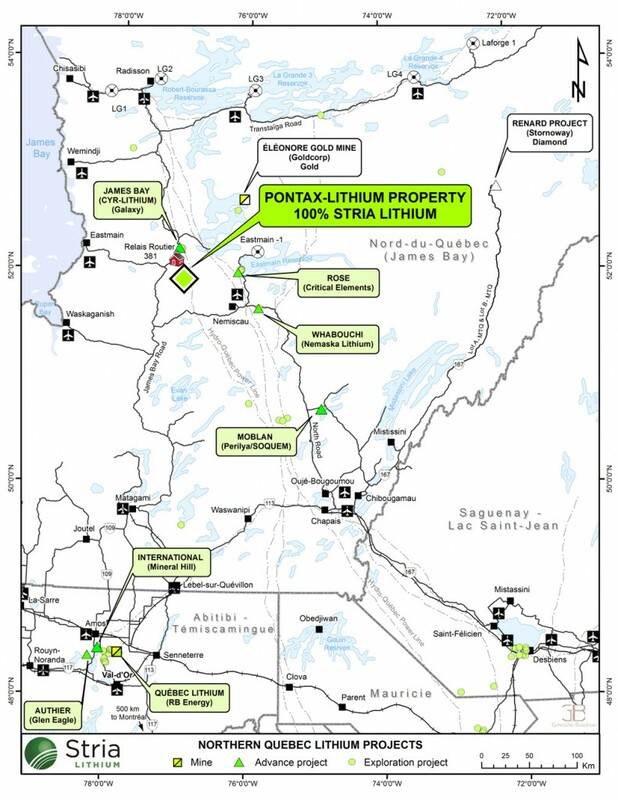 A block of claims deemed prospective for lithium-bearing pegmatite dikes was separated from the Pontax project in 2008 to form the Pontax-Lithium property, and Sirios was designated as the operator of the lithium exploration program. In 2011, the property was acquired by Khalkos, through a spinoff of Sirios’s non-gold assets and the subsequent acquisition of Dios’s interest in the project. The Pontax lithium occurrence is located on a hill crest, composed of vast outcrops of blackish metabasalt cut by tens of metres wide subvertical and east-west trending white pegmatite dikes. These pegmatites dikes are granitic in composition and contain significant, although variable, amounts of light blue spodumene, plus traces of lepidolite, muscovite and beryl. Holmquistite, a bluish lithium-bearing amphibole, is present as an alteration of the metabasalt or of the iron-rich sediments in vicinity of the pegmatite. Previous exploration work on the property from 2006 to 2012 comprised ground prospecting and outcrop sampling, geological mapping, airborne electromagnetic survey, mechanical trenching, channel sampling and limited core drilling. Seven core holes (total: 864 metres) were drilled on the property in 2009 to test a 400-metre section of the pegmatite dike swarm described as the Main zone. All seven holes intersected lithium-bearing spodumene-rich pegmatite dikes, with the best intersection found in hole 09-555-05 (0.97 per cent lithium oxide over 21.0 m (from 36.0 m to 57.0 m), including 1.43 per cent Li2O over 13.0 m (from 36.0 m to 49.0 m). NOTE: All lengths are apparent and may overestimate the true thickness. The Main zone is open both laterally and at depth. The currently known extent and grade of this pegmatite swarm is comparable to other lithium projects currently under advanced exploration in the James Bay area, which is known for its lithium occurrences. Based on encouraging results from the early exploration work and the growing demand for lithium-based products, Stria spent approximately $200,000 on a bulk sampling and metallurgical testing program, as recommended in the Technical Report (2013) on the Pontax property. If spodumene concentrates meet basic commercial specifications, this would be followed by a $1,750,000 Phase 2 program of resource definition and exploration drilling. Please click here for more information on lithium.